Hello and welcome to the 216th instalment of the SWD. 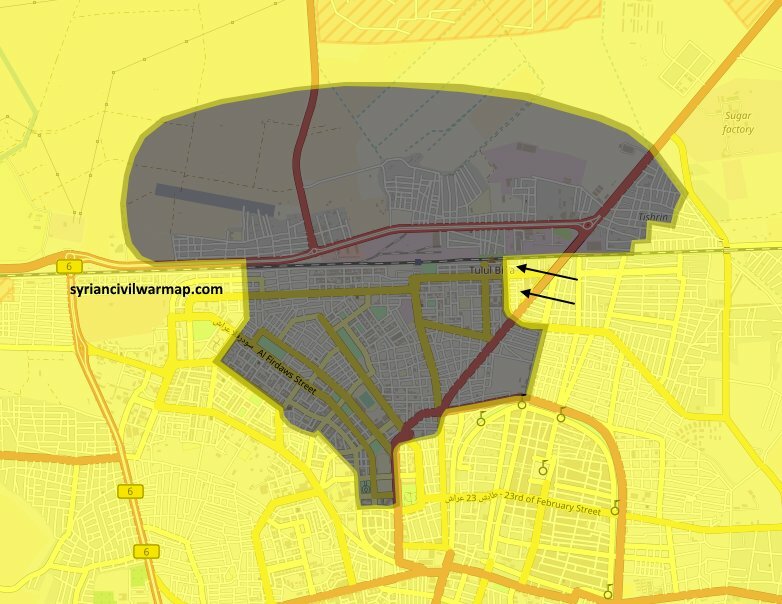 The Syrian Democratic Forces continued its offensive against ISIS from the eastern front lines by seizing an ISIS mortar workshop after advancing in the districts of Al-Amin, Raqa, Remayla and Henni neighbourhoods. Moreover, SDF advances reached the big silos of the city, and its forces took control of the road between Rameelah and Hay Al Thawrah. Although, ISIS snipers killed four SDF soldiers in Rameelah district. Clashes between SDF and Turkish-backed opposition forces around the villages of Kalbin in north Aleppo governorate. Several government air strikes took place in southern Idlib most probably as a result of the HTS and opposition forces offensive in north Hama. Targeted areas include Al-Tah, where a pediatric clinic was hit; the Civil Defence centre in Tamanaa village; different areas inside Khan Sheikhoun, including a hospital and a Civil Defence centre; and some other areas in Al-Hibit in rural Idlib where some civilians were injured. Hayyat Tahrir al-Sham and the Turkistan Islamic Party started a new offensive against government forces in Maan, north Hama. This offensive breaks the ceasefire between the opposition and government forces. The offensive started after a SVBIED attack by HTS hit some SAA positions in which an unknown number of soldiers were killed and wounded at Maan area. According to Hezbollah media, SAA and allies repelled the HTS-led offensive. Air Force Intelligence Groups and other pro-government forces also reported the offensive was repelled. Meanwhile, government forces targeted some villages in north Hama as a response to the recently launched offensive. The targeted areas include Al Lataminah, Kafr Zayta and Murak. Several vehicles and material were captured in the ISIS-held central Syria pocket, in east Salamiyah countryside. The captured material in Uaqyribat includes a T-55, T-62s, BREM-1 ARV and a BMP-1. SAA and allies also captured the village of Ma’damiyah located on the southeast of Uqayribat. Government forces and allies captured the village of Shulayshat near Um Teen Mu’allaq and Nabitiyah which were recently captured, too. Israeli warplanes conducted some airstrikes near the Syrian-Lebanese border after shooting down a “Hezbollah drone” in the Golan area. 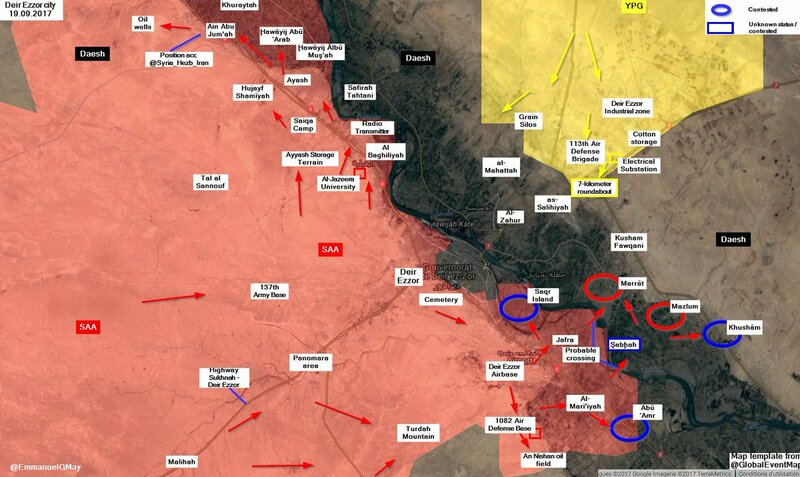 As confirmed yesterday, SAA and allies captured the first town on the eastern banks of the Euphrates named Marat, Mazlum and some parts of Khasham. A suicide bombing attack took place in al-Shaddadi city in southern Hasaka. According to the sources, it was conducted with explosive belts, most probably by some ISIS cell. On the 18th of September 2017, CJTF-OIR has conducted six strikes in Raqqa region supporting SDF‘s operations against IS destroying 25 ISIS vehicles, five fighting positions, a command and control node and a logistics node. The full report on CJTF-OIR strikes conducted in both Syria & Iraq can be found here.